The Austin Chalk has been producing oil and gas in Texas since at least the early 1920's and has cumulative production of 948 million barrels and 5.6 trillion cubic feet of natural gas through the end of 2016. The largest Austin Chalk oil field is the Giddings Field, located in parts of 7 counties, with cumulative production of 526 million barrels of oil and 4.7 trillion cubic feet of gas. The Austin Chalk directly overlies the prolific Eagle Ford Formation which is the primary source of most of the oil in the chalk. Oil migrates into the chalk through microfractures and fills the tectonic fractures and the porous matrix. Until recently, operators targeted naturally fractured zones within the chalk and ignored primary matrix porosity due to the low permeability nature of the chalk. Natural fractures provide high permeability but are relatively few in number and production declines rapidly. That is changing as operators identify and target porous intervals in the chalk with horizontal wells and large, modern multi-stage fracs attaining spectacular results. These operators create their own permeable, fracture network within porous intervals that have a vastly more concentrated and complex fracture network than the natural versions. These fracture systems are much more predictable than targeting and finding the occasional natural fracture. So, the well results should be much more predictable, right? I think the results demonstrate predictability and profitablility. The Austin Chalk has produced oil and gas at least since the 1920's from vertical wells. Widespread use of fracture stimulation in vertical Austin Chalk wells began in earnest as a response to the 1973 Middle East Oil Embargo. Oil production increased over the next six years from 7,300 (BOPD) barrels per day to 147 (MBOPD) thousand barrels per day in 1981. Gas production increased from 7 (MMCFPD) million cubic feet/day in 1974 to 475 (MMCFPD) million cubic feet per day in 1982. Austin Chalk production declined as oil prices declined thru the 1980’s. The next shift in technology began in 1989 with the widespread use of horizontal drilling. Application of this technology further boosted oil production through drilling of horizontal wells and horizontal multi-lateral wells from 50 MBOPD to new highs of 165 MBOPD and natural gas from 171 MMCFPD in 1989 to 1,390 MMCFPD in 1996. The combination of horizontal drilling with the innovation of multi-stage fracture stimulation in horizontal wells created the shale revolution. This is the single largest innovation in the oil and gas industry in at least the last 50 years. Application of this technology in the underlying Eagle Ford formation created production growth from essentially ZERO in 2008 to 1.7 MMBOPD in 2014 at its peak. The Austin Chalk however, has been largely ignored until the application of this technology began in ~2013. Finally, in 2015, the Austin Chalk oil and gas production began to slowly increase after years of slow decline. Oil and gas production has increased steadily from ~24 MBOPD and 200 MMCFGPD to 75 MBOPD and 320 MMCFGPD by the end of 2017. Through that same time period the number of producing chalk wells declined from 3,773 to 3,309, a loss of 464 producing wells! This uptick in production is mainly attributable to drilling activity in Karnes County. The potential productive area in the Giddings Field is much larger than the Karnes area. After seeing the results of previous technological innovations and associated production growth, one can only imagine how high production could go. After all, the Austin Chalk reservoir is the direct recipient of massive amounts of hydrocarbons generated in and expelled from the Eagle Ford Shale source rock. 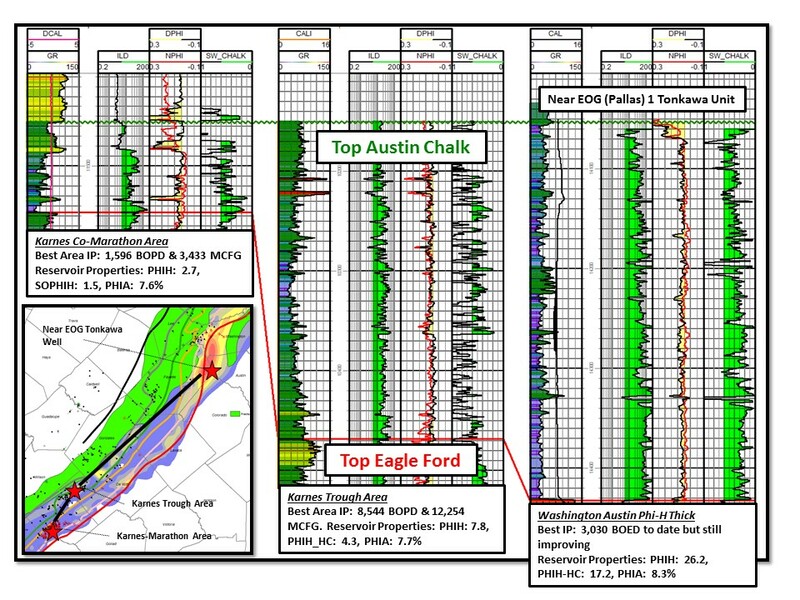 Enervest, Blackbrush, Gulftex, Marathon, EOG and Murphy have been responsible for the development of the Austin Chalk in the Karnes Trough and Eastern Monocline areas. This area had been drilled by other operators for years searching for Austin Chalk fractures and associated oil and gas production, but outside of Peach Creek and First Shot Fields results were disappointing. 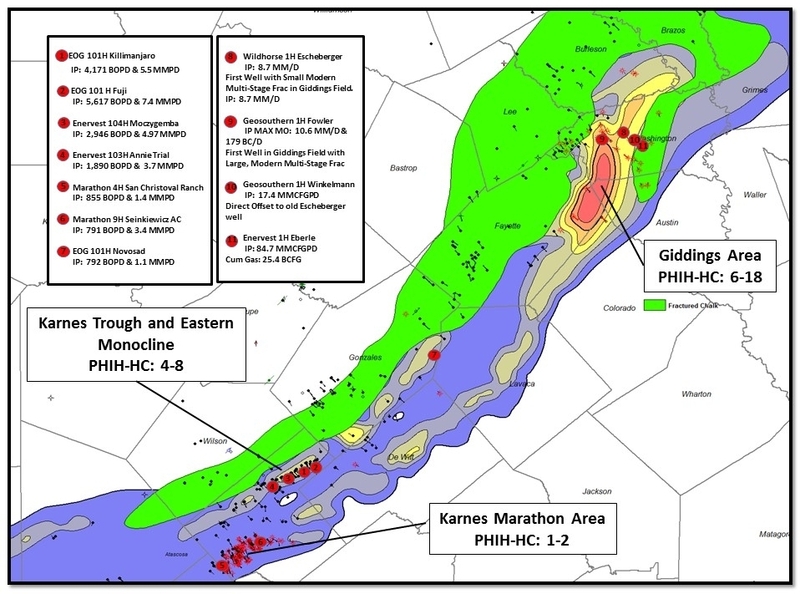 Blackbrush Oil & Gas and Gulftex Energy were the first companies to target porous intervals in the Middle Chalk in northern Karnes County with initial potentials in excess of 2,000 BOPD. Normally the Austin Chalk has very low porosity, but in this area the chalk has intervals where porosity exceeds 8%; truly remarkable considering most of the chalk has porosity of 2%-3%. EOG quickly followed Blackbrush and Gulftex, drilling the Kilimanjaro 101H well that had an IP of 4,171 BOPD & 5,546 MCFGPD with cumulative production of 1,008 MBO & 2,138 MMCFG in just 21 months! These results are very impressive, but when you look at the underlying Austin Chalk Reservoir Volume Map (Oil Saturation x Thickness x Porosity) these results should not be a surprise. In the areas where the reservoir volume increase in northern Karnes County, the well results improve dramatically. There are other areas along trend where the reservoir volume increases dramatically that warrant further investigation, too. Along the Cretaceous Shelf Margin in Fayette, Colorado, Washington, Austin and Burleson Counties there is an unfractured area of very high reservoir volume, sometimes exceeding 15 PHIH-HC as compared to 4 to 8 PHIH-HC in the Karnes Trough area, see the yellow to red areas on the map. The potential in this area is tremendous and operators have noticed. Older down dip Austin Chalk gas wells in the fractured trend have ultimate recoveries up to 38 BCF at flow rates of 30 MMCFPD to 84 MMCFPD! These very high flow rates also indicate that the reservoir is extremely over-pressured. Over-pressure is a game-changer in tight reservoirs, "Pressure is your friend" is a phrase often heard from geologists and engineers studying unconventional resources. Further research into shut-in casing and tubing pressures indicate this is absolutely the case, with bottom hole pressures exceeding 10,000 psi. Let’s take a closer look at the changes in the Austin Chalk from Karnes County to the Giddings Field Area on the cross section below. The line of cross section is shown on the inset map and it trends along strike from Karnes County to northern Fayette County. In the Karnes Marathon area the Austin Chalk is very thin 50’-100’ with a PHIH-HC of only 1.5. Production rates in this area have been good, especially for such a thin pay section, with IP rates ranging from 300 to 800 BOPD and 2,000-5,000 MCFGPD. The Karnes Trough and Eastern Monocline area has better reservoir properties with the PHIH-HC in the range of 4-8. This area has much better initial rates of 800 BOPD & 1,400 MCFGPD all the way up to 8,544 BOPD and 12,254 MCFGPD from the new EOG 103H Elbrus Unit well. Wow! Moving north to the Washington Austin County area the PHIH-HC is in the 6 to 18 range, even better than the Karnes Trough area. The best IP to date is 3,030 BOEPD utilizing choke management. Excellent results with excellent reservoir. The blow up of the well below shows the quality of the Austin Chalk reservoir with porosity averaging over 8%, but the thickness and PHIH-HC is much greater. The log also exhibits mud cake buildup showing that the chalk has good permeability over that 40’ interval and almost unheard of in unconventional plays. Mud cake build up is a good permeability indicator in conventional reservoirs so it is highly unusual to see it in unconventionals! One must also consider, given the high PHIH-HC, that the potential exists for multiple benches in the unfractured areas. Marginal to the unfractured area we will see that Enervest has drilled wells beneath older existing wells and had excellent results, but be aware that these older wells were mostly unstimulated. I have previously demonstrated with maps and cross-sections that the Giddings area has huge potential and finally the well results exist to prove it. There are a number of new completions across the trend that "prove up" the core of the Giddings Matrix Porosity play. The Austin Chalk PHIH-HC Map (Oil Saturation x Thickness x Porosity) above shows the completed wells from January 2016 thru early May 2018 with the exception of the SM 1H Escheberger well that was completed in 2013. This well was the first modern attempt at combining horizontal drilling and multi-stage plug and perf fracture stimulation in the Giddings area. The well had good initial test results, but the stimulation was very small compared to fracs being pumped presently and as such, the EUR and IP is smaller than wells being completed today. The map shows the highest areas of hydrocarbon saturated volumes (red to yellow colors) to be in the unfractured areas. The moderately to intensely fractured areas are shaded green and as of this writing considered less prospective due to possible depletion from prior production. Currently, the best targets for horizontal drilling and large multi-stage fracture completions are in the un-fractured areas which do not suffer from prior depletion. In the unfractured areas, this play is primarily a gas play, and make no mistake a lot of "dry" gas will be produced, especially in Washington, Austin and northern Fayette Counties. The opportunity to add liquid hydrocarbons into the mix is limited to the area west of the red, dry gas line to the westernmost limit of the fractured chalk area (green shaded area). This is a narrow area thru Fayette County but begins to widen and encompass more area in Washington and southern Burleson Counties. This is the area that holds the most opportunity to juice operator returns through the addition of higher priced condensate and NGL's. The unfractured matrix porosity play contains approximately 60 TCFG and 1.4 BBO. That's a sizable resource very worth pursuing. The presence of hydrocarbons within the matrix porosity has been proven by recent drilling so the question to be answered going forward is "How high is the deliverability of the reservoir in different areas of the play and how much is the EUR?" I think you will see the deliverability is very high and going higher and given the high volumes in place that EUR’s should be excellent too! The major drillers in the play with completion results as of this update are Enervest, Wildhorse Resources and Geosouthern Energy. Other operators, EOG, Blackbrush Oil and Gas and Verdun Oil and Gas have drilled wells but have not released results as of this publication. So, the money is finally following this play and I expect more to come. I told you this was going to be big! Now to be fair, all of the acreage Magnolia now controls is not prospective for the matrix porosity play, but 1,000 locations is a very large inventory for future development and production growth and Magnolia should be able to ramp up production quickly. For more on this transaction see the following links. Magnolia Investor Presentation & Magnolia Press Release . Now let’s talk about the Enervest Giddings Field well results and see why Magnolia is paying big dollars for this potential. Enervest has released results from 4 wells in Washington County, all very impressive, with the headline well being the 2 Neva which tested 840 BOPD & 12.1 MMCFGPD with FTP 4,536 psi from a 4,715' lateral. Even more interesting is the fact that the Neva 2 well is directly under the older Neva 1 well which appears to be a multi-lateral chalk well drilled in 2003. The Neva 1 well has cumulative production of 77 MBO & 1.357 BCFG with no stimulation reported prior to drilling the Neva 2. This previous production/depletion does not seem to have diminished the production from the Neva 2 well since it had a very robust test. In fact, the Neva 1 well production increased from 665 BOE/Month to 13,550 BOE/Month all due to the stimulation of the Neva 2 well. See production graph below. After initial flow testing, the Neva 2 was choked back starting in January 2018 due to pipeline constraints, and has remained at the steady production level and will likely continue to do so until that flowline is de-bottlenecked. The Lili Marlene 2H well tested 1,439 BOPD & 4.179 MMCFGPD from a 5,355' lateral with 2,800 psi FTP. The Lili Marlene 1H, another older lateral drilled in 1973 directly above the 2H, had cumulative production of 73 MBO & 364 MCFG, un-stimulated. This well also showed increased production of 31x after the stimulation of the Lili Marlene 2H. The Enervest McMahan 2H well tested 617 BOPD & 8.518 MMCFGPD from a 4,772' lateral with 3,250 psi FTP. Their fourth well, the Broussard-Liebscher 1H tested 1,338 BOPD & 4.742 MMCFGPD from a 5,243' lateral with 3,850 psi FTP. All four wells have excellent tests and it will be interesting to watch future results as operators learn more about stimulating the chalk. We are in the early days of fracture stimulation optimization and are learning more with every new completion. I was listening to Wildhorse Resources 1st Quarter conference call today and it occurred to me how good that company is about staying on message. Their Austin Chalk results smoke anything they have completed in the Eagle Ford and yet they stick to the message, continuing to promote the Eagle Ford while keeping the Austin Chalk under the radar as they accumulate more acreage. As soon as they believe the Street is giving them full credit for their Eagle Ford acreage, they will undoubtedly begin to beat the drum, ramp up activity, and tout all of the incremental Austin Chalk value within their portfolio. So how has Wildhorse performed in the Austin Chalk? In short, very well! They have some of the best results to date. Their highest rate well so far is the Brollier 1H well with an IP30 of 3,030 BOEPD (8-9% oil, depending on the release) which roughly equates to 16.7 MMCFGPD & 242 BOPD from a 5,684' lateral. The Brollier well is closely followed by the Lillie Holt 1H which has an IP30 of 2,604 BOEPD (3% oil) which equates to 15.2 MMCFGPD & 78 BOPD from a relatively short 4,815' lateral. Next is the Morgan/Broadnax 2 well pad with an IP30 average rate for each well of 2,483 BOEPD (1% oil) which is 14.9 MMCFGPD & 25 BOPD. Finally, the Winkelmann 1H has an IP30 of 2,387 BOEPD (26% oil) or 10.6 MMCFGPD & 621 BOPD from a 4,762' lateral. In their May 9th Company presentation, they state that they have 53 net locations on a very wide 1,500' spacing with 15,000 net acres and that additional Austin Chalk upside exists on another 85,000 acres, presumably in Burleson County. From the latest PHIH-HC mapping above, the southern part of Burleson County is very high quality and appears to be similar to northern Washington where most of the current production tests have occurred. Geosouthern Energy has completed and released results of nine well tests to date, six tests in Fayette County and three in Washington County. Their first well result was the 1H Fowler well in Washington County and the first Austin Chalk well with a large multistage fracture stimulation. This well was completed with x-link gel and 3,000 lbs/foot sand. It had an IP30 Max Month average of 10.6 MMCFGPD & 179 BOPD. The decline rate has been relatively shallow and the EUR for the well is ~11 BCFG & 133 MBO. Keep in mind that this is the first well with a modern frac in the Giddings area and almost certainly not optimized. This demonstrates the huge potential of this area. The best results for Geosouthern are in the gas window particularly the Winkelmann and Lehrmann wells. These wells tested 17.4 MMCFG and 14.8 MMCFG, respectively. The Winkelmann well has an 8,077' perforated interval as compared to the Lehrmann well's 5,964' perforated interval. If the Lehrmann well is normalized to 8,077' the IP is 20.1 MMCFGPD. Additionally, Geosouthern completed two wells in northern Fayette in the lean condensate window with very good results. The 1H Schlabach well tested 11.2 MMCFGPD & 190 BOPD from a 6,096' lateral while the 1H Keilers well is slightly more liquid rich at 9.2 MMCFGPD & 320 BCPD from a 5,940' lateral. While the IPs are substantial, the most impressive attributes of these wells are their very low decline rates and high degree of repeatability. The southern Fayette County wells in the rich condensate window have not been as productive as the wells farther north. These wells are located in an area where reservoir quality and volume is lower which accounts for the lower test rates and productivity. Flowing pressures in this area are significantly lower than in the wells to the north, also. This may indicate this reservoir is very tight. The best IP to date is the 1H Breitkruz well, which tested at 555 BOPD & 1.748 MMCFGPD from a 5,765' lateral. See the activity map for additional well tests. Examining the results of wells completed from 2016 forward and normalizing for lateral length, the table below ranks the results on a BOE6/1,000' basis. This ranking uses the traditional gas to oil conversion of 6 MCF/1 BO. The Enervest Neva 2 well is the best followed by all of the announced Wildhorse wells. However, if you rank these wells by their economic value by using a 20 MCF / 1 BO conversion instead of the traditional 6 mcf / 1 BO, the ranking shifts in favor of the high rate, liquid rich wells. All the wells on the list have excellent results except for the aforementioned Geosouthern wells (Breitkruz, Kristof, Loughnane and Osina) in southern Fayette County in the poorer rock quality area. There have been 14 wells with announced test results in northern Fayette and Washington County to date. The average IP BOE6 for the 14 wells normalized to 6,000' is 2,628 BOEPD! There are 18 producing completions and 58 active locations shown on the map below in different stages of permitting, drilling or completion. That is quite a difference from the 4 completions and 25 permits, etc. in August 2017. The area has indeed become quite busy and the pace is picking up. In addition to the usual characters, several other operators are becoming active with drilled or testing appraisal wells, pushing the limits of the play into areas I believe are very prospective. Geosouthern is starting to permit/drill multiple wells from a single pad and appear to be testing spacing and lateral placement within the chalk. Spacing rules currently allow for 1,000’ spacing, although this will likely be reduced through field rule changes. Enervest/Magnolia also appear ready to downspace below the 1,000’ level. In addition, there is a high likelihood that at least two benches will be simultaneously developed and possibly more where the porous chalk dramatically thickens. How often do you see EOG listed in the other operators category? Almost never...And it may not be for much longer. EOG has drilled the Tonkawa 1H well in Colorado County and is currently awaiting completion. The "Near EOG (Pallas) 1 Tonkawa Unit" well, on the cross-section above, is drilled just across the county line into Fayette County and is shown on the far right. It has excellent reservoir properties. With the expected high reservoir pressure, 11,000-12,000 psi and high-quality reservoir this well should produce at very high rates not yet seen in the matrix chalk play. EOG has put together a sizable acreage position down dip of other operators in the dry gas window and should have plenty of running room given success with the Tonkawa well. As a reminder, Blackbrush started all the chalk excitement by drilling high rate matrix chalk wells on their position in Karnes County, which they eventually sold to Enervest, which has now become a major part of the previously mentioned Magnolia Oil & Gas. So, thank you Blackbrush! Blackbrush has assembled a 30,000 acre position in Washington, Karnes and Austin Counties according to their website, Blackbrush Energy Operations Map . They have permitted and drilled the most down dip well of the current crop, along with EOG. The Cassidy 1H is currently testing with no results released to date. Verdun is a highly active, private equity-backed oil and gas company focusing on the South Texas Eagle Ford. On their company website, Verdun Oil Company reports a large 60,000 acre Austin Chalk position that spans from the gas window in Washington County up through the condensate window in southern Burleson County. Drilling records indicate that they drilled a ~10,000' lateral well in southern Burleson County (the Verdun-Cashion 1H), which is currently awaiting completion. This well is on trend with Enervest's McMahon and Neva wells and has similar rock quality, which should yield exciting results upon successful completion. See link: Verdun Oil Company website . There have been 14 wells with announced test results in northern Fayette and Washington County to date. The average IP BOE6 for the 14 wells normalized to 6,000' is 2,628 BOEPD! The play has proven porosity in the 6% - 8% range, thick net pay 150' -300', high hydrocarbon saturation, significant over-pressure, a very brittle reservoir that fractures naturally which all contribute to very high flow rates. The game is on and will be very fun to watch! An old oilfield adage simply states "big fields get bigger." Giddings is the largest field in the Austin Chalk trend and the potential remains high for draining new reserves from improved drilling and completion techniques in this old giant. This has already occurred twice previously as each successive wave of innovation boosted production to new heights. Look for increased drilling activity in the area as new entrants finalize their lease positions, prepare to drill new development wells and deploy the latest completion techniques. This technology is transformational and makes oil and gas reserves accessible that were not previously recoverable. Production should be on the rise and make new highs in the very near future. "Make Austin Chalk Great Again!" "Drill Baby Drill!"